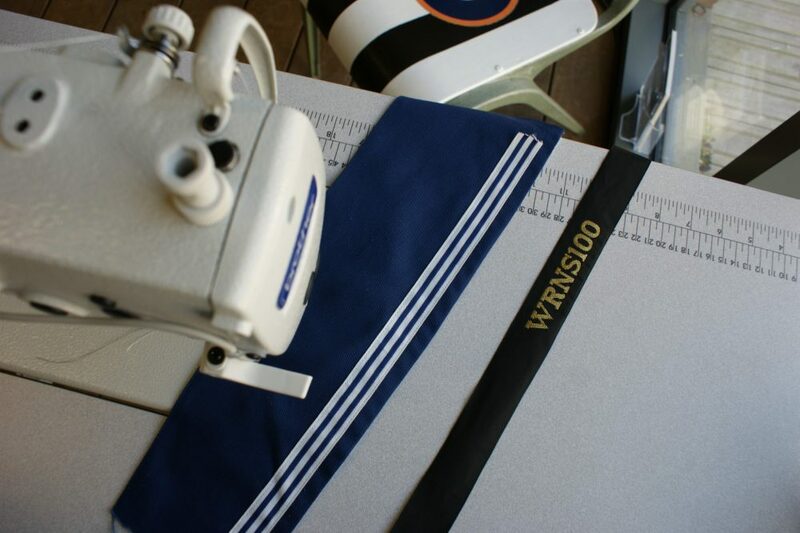 From sailor ribbon to cap tallies. A little while ago I spent the afternoon hanging out with a couple of people who I’ve had the enormous pleasure to get to know over the last few years. Steve Bomford and Rachel Owen are simply, lovely. We first met when I was working in my previous job and have stayed in touch ever since. Our paths have crossed again professionally but I’ve always tried to keep up to date with what adventures they’ve been having too. I genuinely love spending time with them, they inspire creativity, have a hugely warm welcome and some pretty entertaining stories. Together they form ‘Company of Makers’, a social enterprise which is based in the beautiful Hotwalls Studios down in Old Portsmouth. I popped by to chat about their new studio and their exciting 2017. Steve and Rachel started Company of Makers a few years ago, founded on the basis of the work that Rachel’s social enterprise had been doing up in Liverpool. Rachel had set up a creative organisation, ROOD Vintage, after seeking a career change from working in television “to do something more worthwhile”. Rachel went to the School for Social Entrepreneurs in Liverpool and discovered that there was more to the third sector than charity shops and Oxfam! All of this, combined with Rachel’s fashion degree and dissertation on ‘Women’s Fashion During WWII’, led to ROOD Vintage which helped women recovering from anxiety and depression in the most disadvantaged parts of Liverpool and taught them how to “‘make-do-and-mend’, unpicking old garments and learning how to sew them into new clothes and soft-furnishings, taking old bits of furniture and ‘shabby-chicing’ them”. She discovered that through the process of learning new skills and keeping their hands busy, the women opened up to each other about what they were facing and offered support. So Rachel became a qualified person-centred counsellor. Not to run group therapy sessions, but to safeguard the women while they sew and to know how to work with someone if they became vulnerable. As ROOD Vintage grew, Rachel discovered that the model could help all sorts of different groups of people from those with disabilities to groups of men who were also keen to try something new. 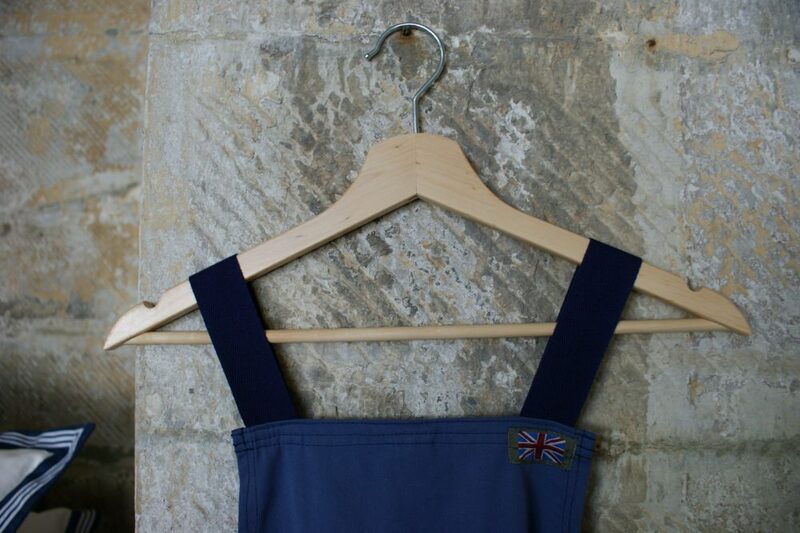 Union Jack detail adorns ‘No 8 Apron’. A sea of militarily inspired cushions. Steve and Rachel secured funding for an initial 12 month joint project with the support of Commander Tim Ash, who was Executive Officer at the time of Portsmouth Naval Base at the time, and so Company of Makers was formed. After a baptism of fire into the military world (Rachel: “who knew buildings could be called HMS? !”) and needing a dictionary to translate the Jackspeak (Naval slang), they realised that the impact of their project was making ripples through the Veteran community in Portsmouth. Their initial project, in the Veterans’ garden at the old Haslar hospital, saw their group of Veterans taking old pieces of furniture and stripping them back ready to be brought back to life with an injection of personality and paints, for them to take home and keep. 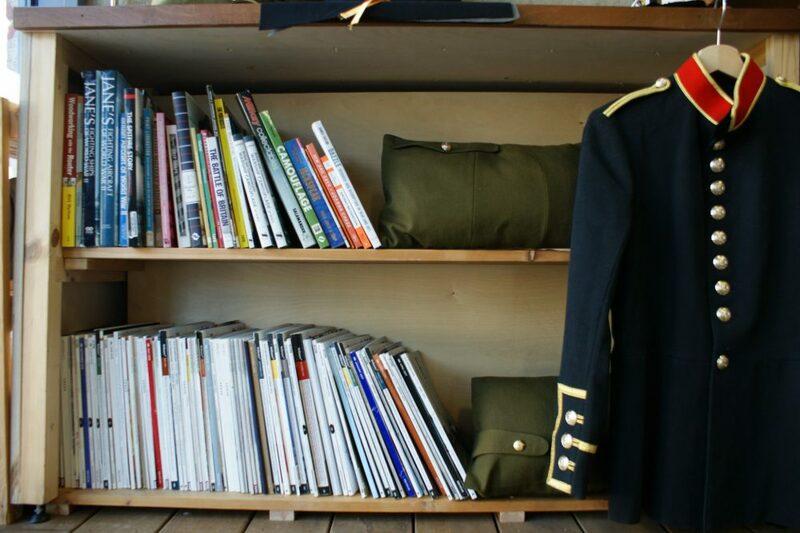 Inspirational reading material complete with Royal Marine Bandsman tunic. Small desert camo shoulder bag – Including NATO label. 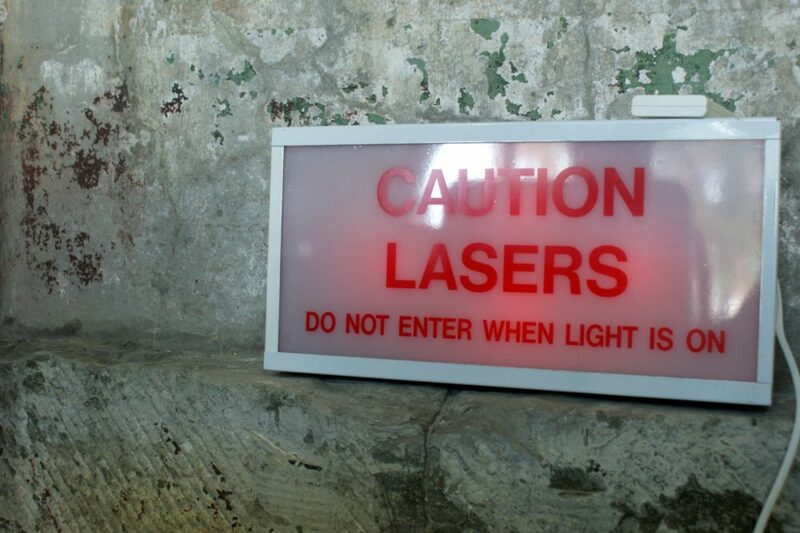 ‘Caution Lasers – Do Not Enter When Light is On’ – Salvaged from Haslar Hospital, Gosport. Fast forward a few years and the creative duo are still making waves in Portsmouth as well as further afield. Since those first workshops, Company of Makers has continued to enlist military personnel, their families and Veterans. They run a regular sewing group within one of the local ‘married patches’ (Forces family housing) and have worked alongside other organisations including Portsmouth NHS Clinical Commissioning Group, Shore Leave Haslar (therapeutic Veterans’ gardening project) and Help for Heroes to provide tailor-made courses. One of the ideas that Rachel and Steve came upon early on was the ability to turn old uniforms into something much more exciting. 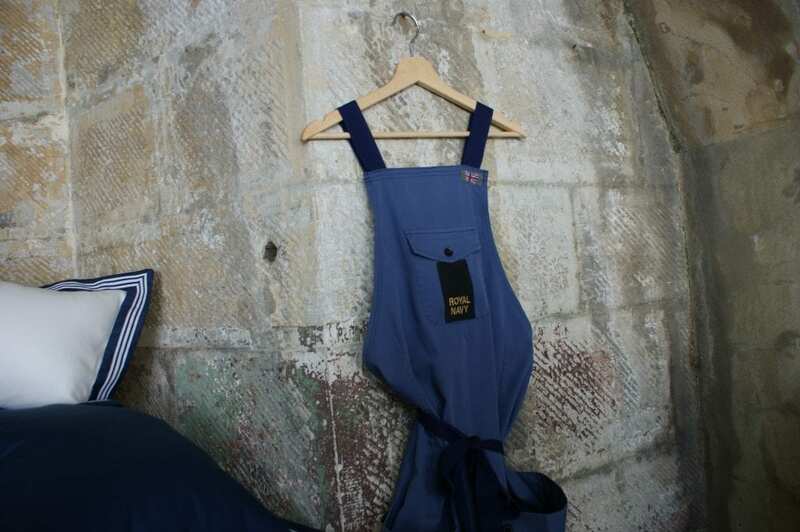 From Naval ‘4’s’ (working rig) that has been transformed into workwear aprons or formal uniforms that have found a new lease of life as cushions – Company of Makers have created some stunning pieces which quite obviously, are a labour of love. Unpicking the original uniforms and cutting new patterns takes a long time but there is something therapeutic in the process and the end result is well worth the time. Through their links into the old military hospital at Haslar, Company of Makers have also been able to access other unusual materials to incorporate into their workshops to be turned into something beautiful as well as meaningful. Candle holders from the old hospital Physio Department gym bars, table tops of wood taken off HMS Warrior during its refurbishment and garden planters created from pallets (check out their Pallet School blog!). No 8 apron that ‘Makes you look more manly’! 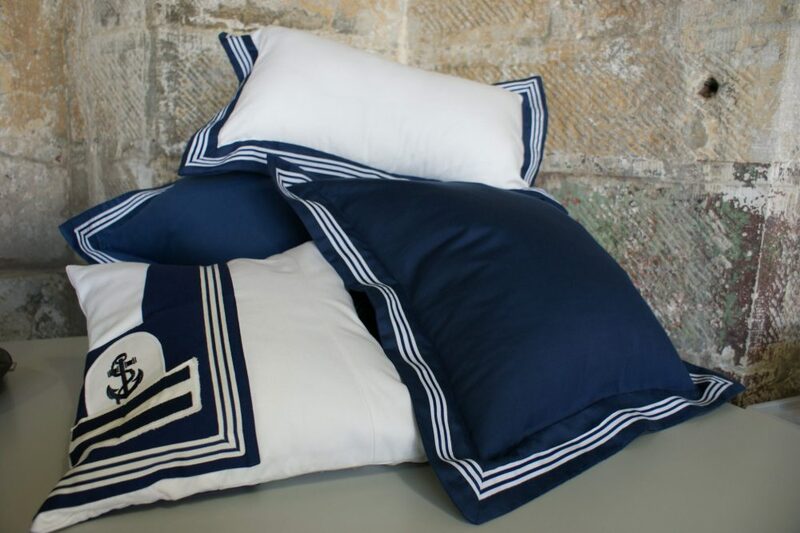 Sailor collar inspired cushions from recycled uniforms and new fabrics. 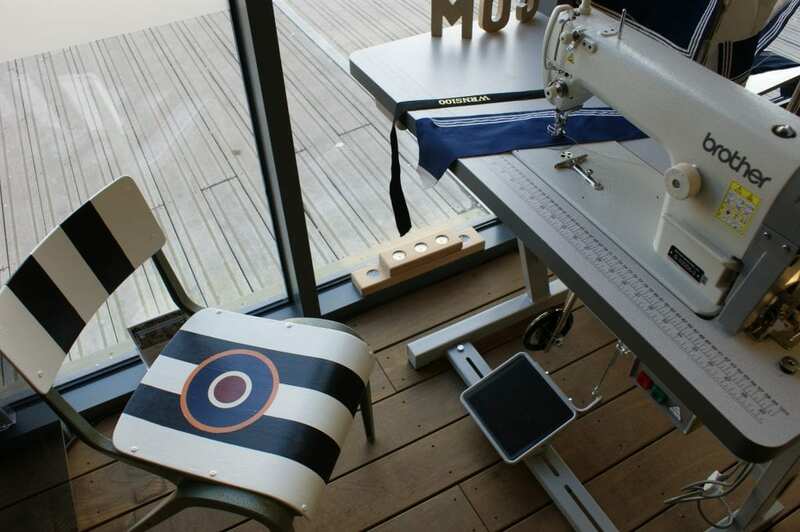 D-Day inspired chair complete with RAF roundel. With all this going on, Company of Makers still needed a permanent home with several ‘near misses’ from finding the perfect premises. When they actually got their Hotwalls studio in November 2016 they didn’t really believe it but it was true and now they are finally able to call it home. Their studio has enabled them to produce a mix of products to sell, generating an income to help fund the work they do with the Veterans. Their range is split in two, ‘commissioned’ (a play on an officer’s Royal commission) and ‘non-commissioned’. Commissioned are one-off, high-end pieces made especially for someone out of their own, or a loved one’s, military uniform. 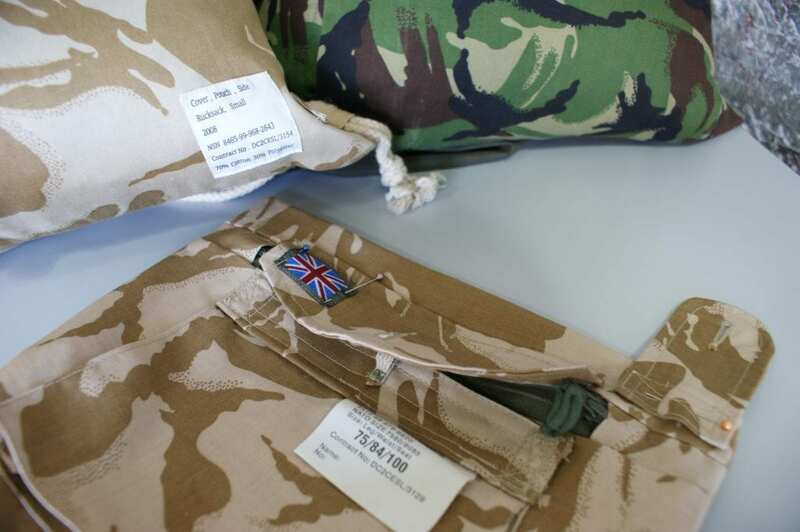 Such as a mess kit made into a cushion, or Commando camo pants reworked into a bag. All made to order, totally personal and unique. 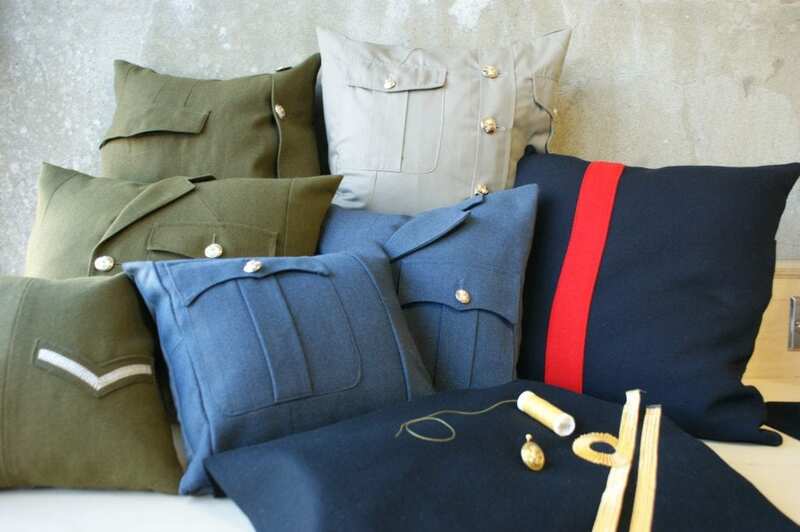 Most recently, it has been all about tapping into the military inspired home and fashion trends, launching a new range of homeware influenced by military uniforms and the stories of the Veterans that Steve and Rachel have worked with. These are the non-commissioned items, their ‘off-the-shelf’ collection. 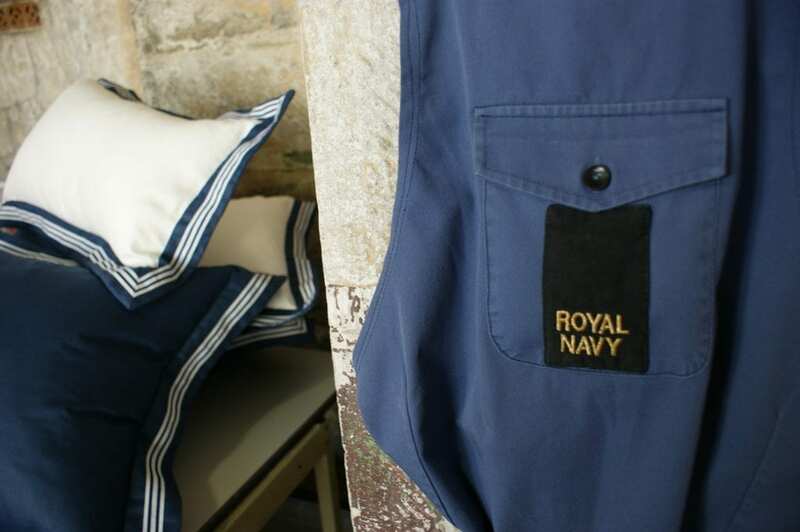 The earlier cushions, aprons and bags created from old uniforms on the dining room table years ago gave rise to these new ‘non-commissioned’ designs that are made from new uniform fabrics and trims but with all the style of those made from the original gear, such as their ‘sailor cushions’ inspired by the iconic navy and white sailor collar. The excitement about Company of Makers having taken up residence at the Hotwalls combined with their new product launches is clearly rooted in some amazing work over the last few years with Veterans, their families and Serving personnel. Rachel and Steve are buzzing with ideas and innovative programmes that will support their future workshops. I can’t wait to see what they come up with next and am delighted to be along for the ride. To find out more about Company of Makers and their programmes, please do take a peek at their website. We’d like to thank Beckie for writing this article which was originally published on her website – The Sussex Girl. Beckie is a lover of beautiful design, baking, exploring, the sea and gin. Most days spent working for a military charity and also active Naval reservist. 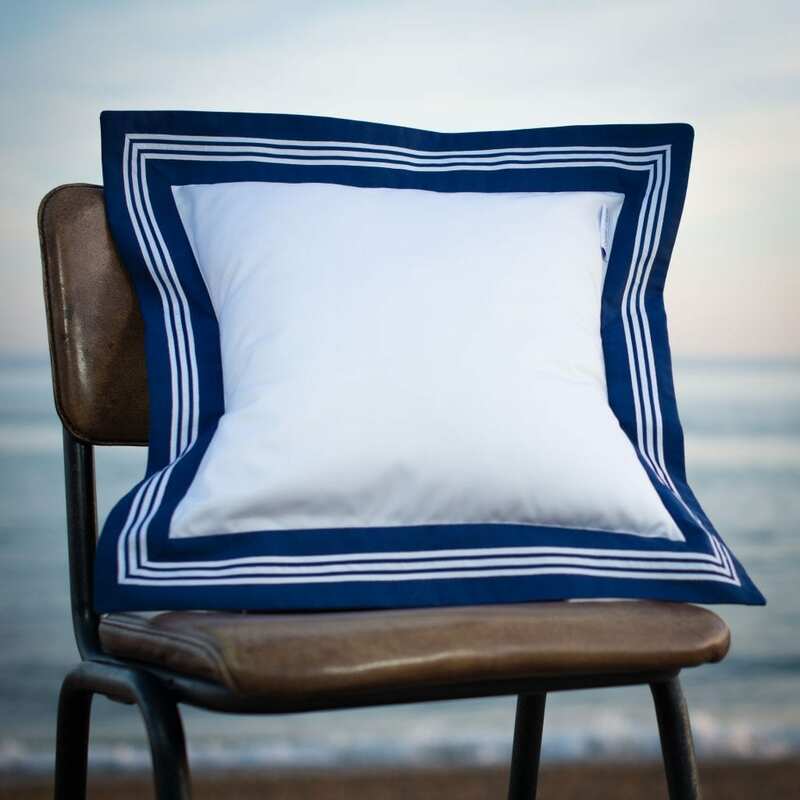 Sailor cushion from new fabrics and the same ribbon the Royal Navy uses. Tropical uniform transformed into cushion. 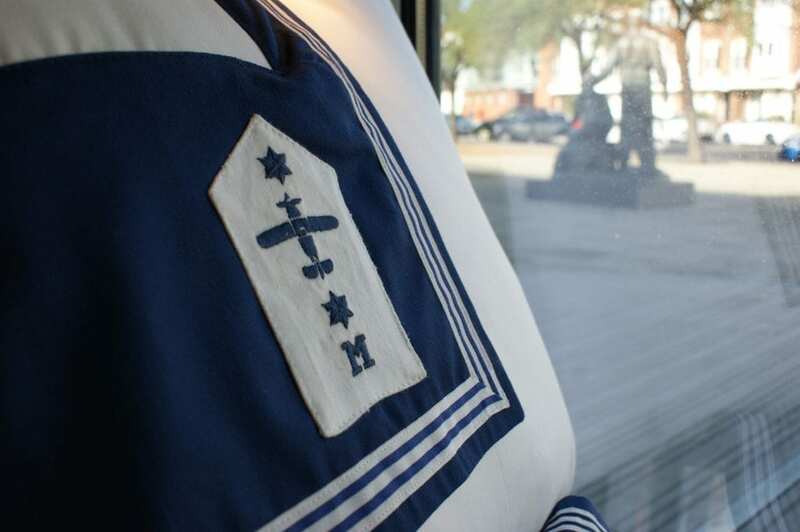 From 8’s to sailor cushions.